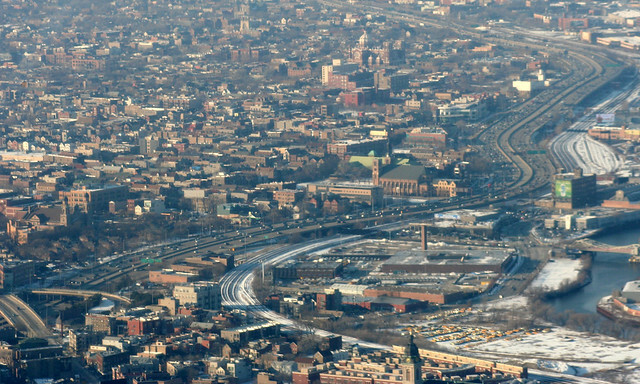 One of my earliest impressions of Chicago, driving in from the north, was the string of grand churches visible from the Kennedy Expressway. I visited a few of them in my early explorations of the city. Then my attention wandered away, further afield to the mid-century suburbs and south side, and I never really got back to these near west side neighborhoods… until recently. Lately I’ve been on a mission to visit all these landmark houses of worship, a loose grouping that I have dubbed the Trail of Churches. A glimpse from the Sears Tower should show why the name fits. At top-center, the domed roofline of St. Mary of the Angels. Below it, St. Stanislaus Kostka, with the highway swerving to avoid it. At far left, the low twin towers of Holy Trinity Polish. (Not visible, but close to Holy Trinity are the abandoned St. Boniface, and the very much active Holy Innocents.) And at bottom-center, just peeking into the frame, is the taller tower of St. John Cantius. These four are among the city’s most spectacular religious buildings. Stick around and we’ll go on a tour of each one in turn. 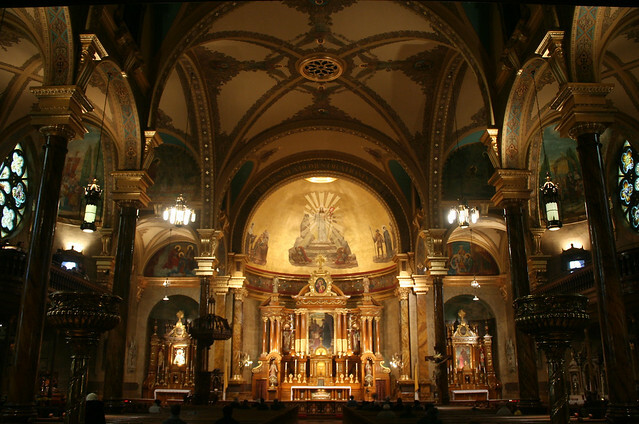 Today: St. John Cantius Catholic Church. 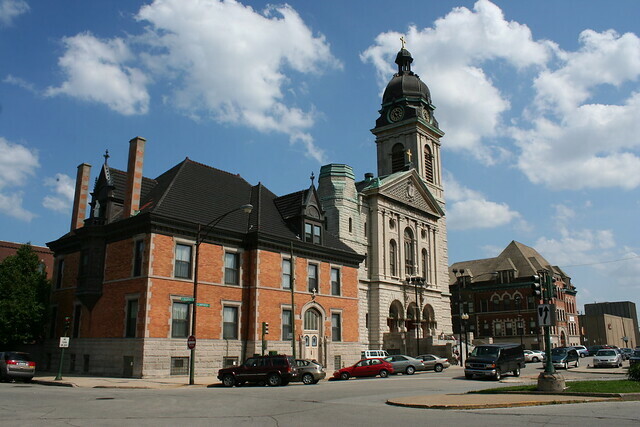 After its booming early years, the parish followed an arc of decline and revival. The downturn began in the 1920s with Ogden Avenue’s construction through the area, and bottomed out in the 1960s after the Kennedy was rammed through the neighborhood and innumerable residents fled. 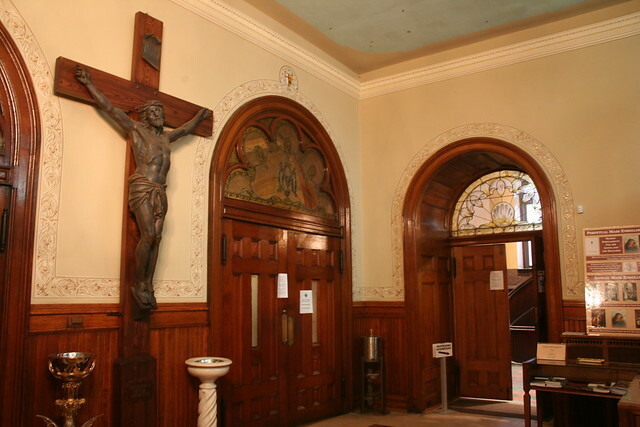 Decline began to reverse in the 1980s with the reintroduction of more traditional Mass attracting new congregants; the church’s fortunes have reached a magnificent new peak today as the building was renovated and restored in 2012. Today the church offers the traditional (pre-Vatican II) Mass in Latin, and has a strong emphasis on sacred music and art. 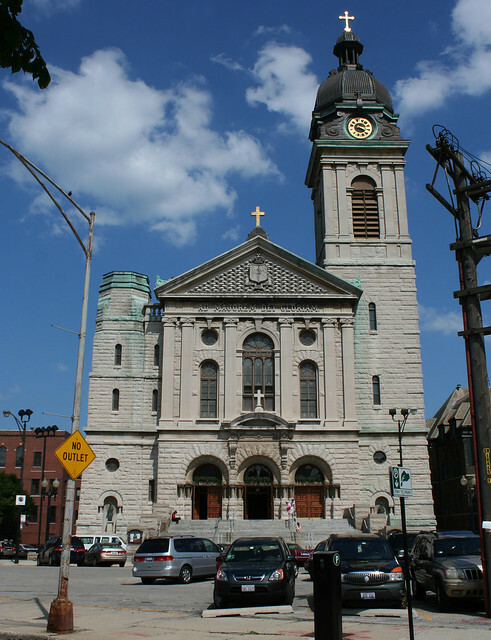 Architecturally, St. John Cantius Church is a hybrid of styles. The massive, dour exterior combines Classical elements – such as a flattened Greek temple front with quasi-Corinthian columns – with heavy, blocky stone that gives it some kinship with the Romanesque. 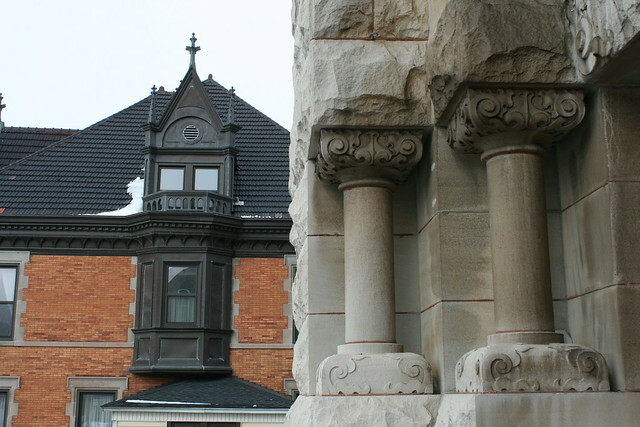 At the entryway, “squashed” columns call out a lineage that includes ancient Greeks, Renaissance Italians, and contemporary Victorians. They emphasize the sheer massiveness of the building – as if at any moment they might snap and bring the whole thing tumbling down. Their smooth shafts are a moment of machine-like precision bursting out of a mass of roughly split rock. This sort of perversity was common among Victorian architects, who delighted in twisting expectations. The interior lives up to the church’s official desigation of its style as “Baroque”. The modestly proportioned columms support pediments and seem a touch too large, intentionally “off” for dramatic effect. Huge arches spring from these dainty supports, a dazzling display of engineering. Nearly every surface is gilded, sculpted, or painted. In a lesser setting it might be gaudy – but here, the glory of the decoration simply matches the grandness of the space. The sanctuary is enormous. Soaring columns support vast round arches. The crossing is of tremendous proportions. The overall effect is of a open, lofty, airy space – a welcome respite during Chicago winters, which can leave a city resident feeling perpetually imprisoned in the small rooms of their house or apartment. 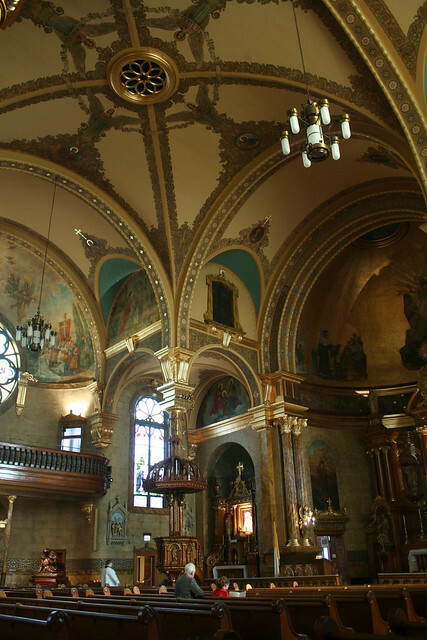 St. John Cantius is a golden space – it shimmers with browns and yellows, and blues and greens punctuate its murals and stenciling, but it is the golds which leave the deepest impression. The 2012 restoration has left the space in immaculate condition. Column heads and brackets are gilded in gold, and thanks to recent renovation efforts they gleam spectacularly. 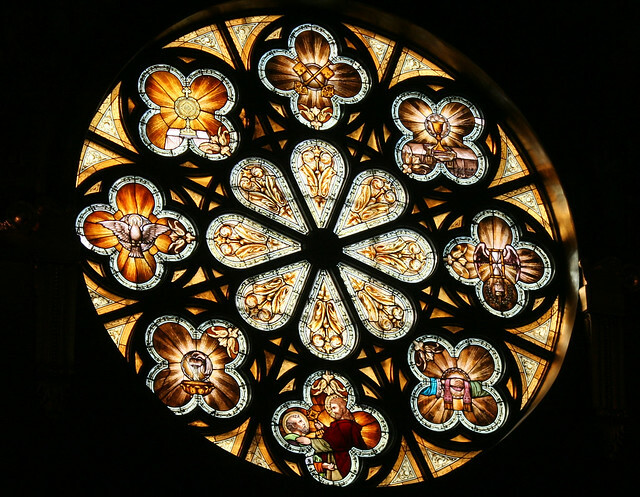 Even the stain glass reinforces the golden hued tones. 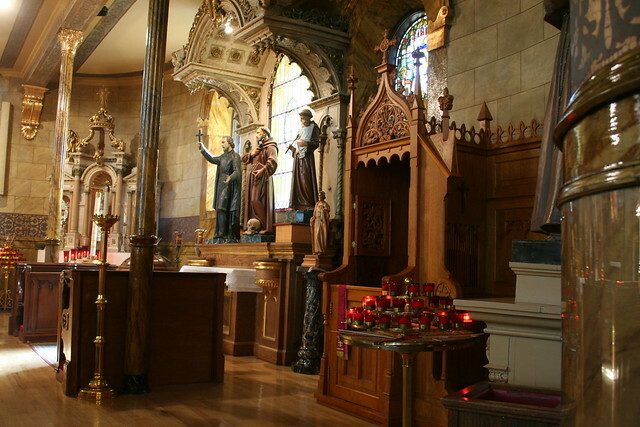 The reredos behind the high altar is a Mannerist confection, with clustered columns supporting a split pediment with a rounded arch pediment in the middle. A small round skylight brings light down onto it from above. 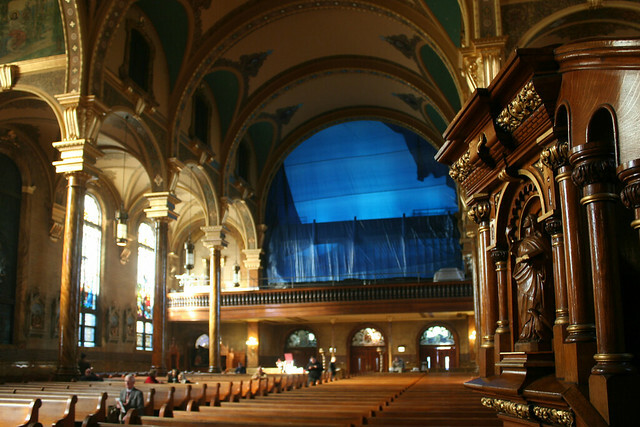 At the time of this writing, the old organ is being replaced by a new one; blue sheeting covers the balcony space where the new instrument will be installed. 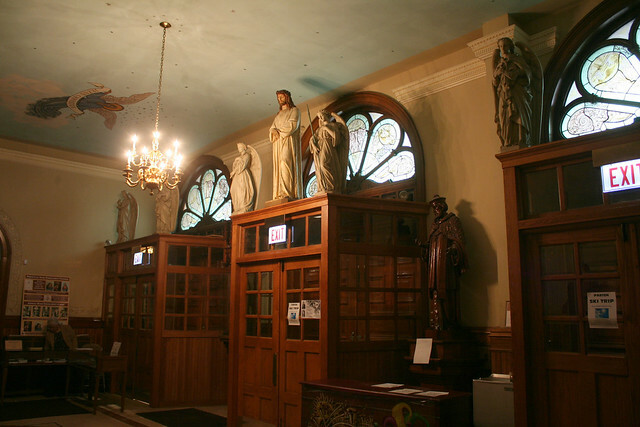 The church is heavily laden with statues of saints and apostles; they are tucked away in the various side chapels and even in the stairwells. 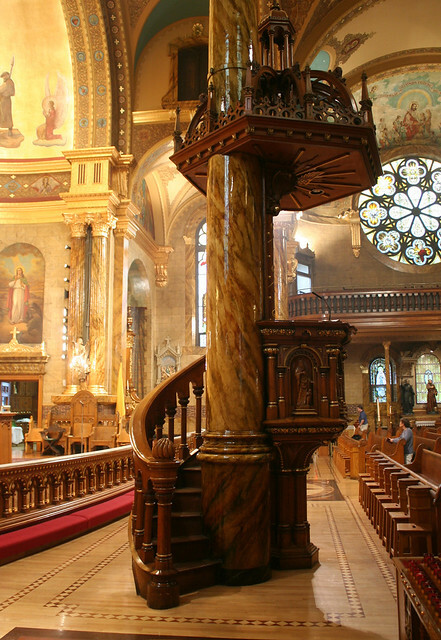 The pulpit is a fine example of the church’s Baroque Revival style – its wooden stairs snake sensuously around a column, to an intricately carved wood speaker’s stand with an even more elaborate sounding board overhead. 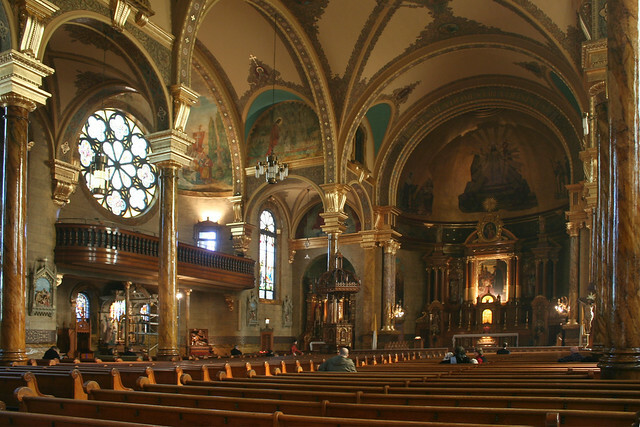 Together with its school (1903) and rectory (1901), St. John Cantius Catholic forms a grand and amazingly intact group of turn of the century architecture. This entry was posted in Aerial Photography & Views from High Places, historicist churches, Pre-war churches, Victorian architecture. Bookmark the permalink. Excellent post! 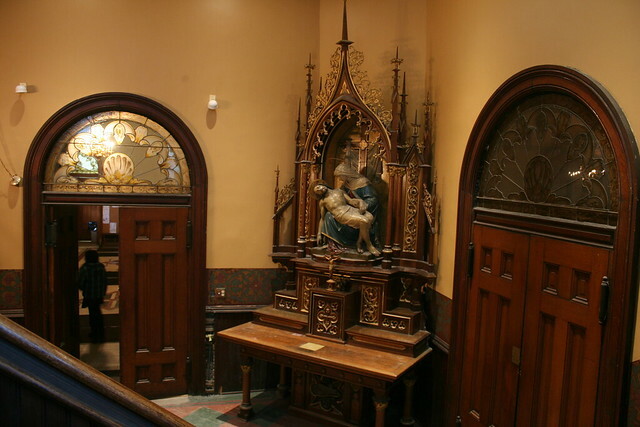 Our immigrant fore-parents really put everything they had into their parish churches.